Life of a mad typer: Hello kitty Pumpkin tutorial. At work they are holding a pumpkin decorating contest and we voted on a design and Hello kitty won! So we begun to plot out what to do and our Manager brought in a witch hat thus a theme with Hello Kitty was chosen. We were not allowed to cut into the pumpkin. I figured I would write a tutorial on what steps was taken to make it. 1. Choose your pumpkin and clean it. 2.Come up with a concept and create a design. 5. A.) Make your ears, because of the limitations of the contest we did them with cardboard. Now this part we did out of order and ended up having to redo it later so spray paint the ear after you have it on the pumpkin. I originally cut out 2 ears but after consulting with my team because of the hat we only needed 1 ear. So I glued them together to make one thick ear. B.) Run the hot glue gun over the edges to fill in the empty ridges. C.) Run small amount of glue on the bottom of the ear and stick on the pumpkin. D.) Fill in the space with hot glue between the pumpkin and the ear. Building slowly letting it cool before adding more. Once the empty space is filled run the glue across the seams to make sure there is no crease. E.) Spray paint the ear on the pumpkin so that it blends. 6. Draw your eyes and paint them in. I am horrible with drawing circles so Joystick drew the circles and I filled them in. 7. Then select your placement of the nose draw it and fill it in. Now with the whiskers you can do it many ways. Pipe cleaners/straws/felt/paint it on. We chose to use pipe cleaners. I would recommend black ones but we didn't have those so we used the white ones we had. 9. Poke a small hole with a sewing needle. 10. Stick the end of your pipe cleaner in the hole. Repeat on the other side!!! Stuff some stuffing or paper into the hat to hold shape. 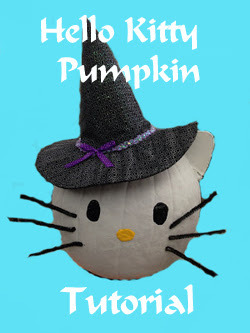 Voila you now have a Hello Kitty witch pumpkin. Cross your fingers that my group wins the contest!!!!! Share this post by using this button on your site! Thank you! I still can't get over how good she turned out. I so love this!!! Awesome Job! Love it - such a cute idea and so much more fun than cutting open and gutting the poor pumpkin! Yes lol I am kind of a wuss and I hate the feeling of the insides so this was ip my alley. Plus it will last longer and won't attract bugs. You know I love this! She turned out so good! I hope you win it, how can they resist HK's cuteness? Good Luck!